November 21, 2018, 3:55 PM · About four years ago, I took my lonely violin from the case where it had been languishing for upwards of three decades. That one simple act – reconnecting with what felt like a lost limb – brought me back to life in ways that I have tried to express through my postings on violinist.com. As I ponder my myriad blessings during this season of gratitude, I find myself reflecting on the role the “v.com” community plays in my life. Before I elaborate, let me admit to being at a stage where I deliberately try to avoid bad news. Of course, that's as likely as me finally learning the alto clef. Horrific acts, human stupidity, and nonsensical thinking have become part of our cultural climate. Yet I strive to move forward each day as if my feigned normalcy will somehow neutralize the current state of chaos. I'm certainly not advocating living under a rock. That said, I do not seek out vicious comment boards or negative websites where people seem to delight in the misery of others. When it comes to bad news in the music world, trust me – I'm keenly aware of the fall of one great musician after another as the result of abhorrent behavior. I know this brand of evil exists. I've witnessed it. To a degree, I've been personally affected by it. But I simply cannot succumb to the outrage – not where music is involved. I rely on others to root out the truth and mete out the appropriate punishment. If that makes me less of a person (and it arguably does), then I will accept that fate. I wish the offenses made me madder. Unfortunately, they just make me sad. For me, I cannot allow music to become a place of discord and disillusionment. Which is why I continue to gravitate to this site. If a scandal or crime is discussed (and that's completely appropriate given v.com exists to keep us informed of what's happening in the global violin community), it is done in a manner that provides facts, not opinions. I read the articles, try to ingest the weight of the content, and (I'm not proud to say) am happy when we get back to the business of extolling the violin's virtues and dissecting the complexity of bow distribution. I need not worry that bad deeds will persist, nor that they will be publicized. They most certainly will, on both counts. I will continue to focus on those actions that glorify the human condition and add to its beauty. In the spirit of giving thanks, let me recount a few of the people on v.com who have brought a dimension of goodness to my life. I express my gratitude to Elisabeth Matesky, who strives to keep the memory of her beloved mentor, Nathan Milstein, alive. I am inspired by the musings of Michael Kennedy, who reminds us, always with warmth and humor, that we are never too old to challenge ourselves. I take heart in violinists like Paul Stein, who even after a formidable career with one of our top orchestras, still grapples with bow strokes, left hand issues, and the agony of second position. I am delighted by Joshua Iyer, a young violinist and composer, who writes about his performing experiences in a way that reminds me of my youthful love of music. I find strength in the journey of Karen Allendoerfer, who provides a candid glimpse into her rigorous preparation process. I am grateful to Paul Deck, who takes the time not only to get out and hear live performances, but to write about them for the benefit of those not in attendance. I am intellectually challenged by Pauline Lerner, who enlightens us with socially-significant information, such as music during China's cultural revolution and, nearly a decade ago, the premier of Jennifer Higdon's violin concerto. I am moved by George Wells, who has the compassion and energy to teach those who cannot afford lessons, and is always there to offer a word of encouragement. And, to state the glaringly obvious, I feel blessed that Laurie Niles has created a forum for those of us who simply love, and are endlessly fascinated by, the violin. She has vicariously taken us to competitions across the globe, master classes with the greats, concerts in every possible venue, and even given us a rare look inside the lives of our favorite performers. I am truly humbled and grateful to be part of this community. The remarkable opportunity I've been given to contribute to this site as a writer is not lost on me. I offer up my words in a feeble attempt to express my profound gratitude. I give thanks that such a wondrous instrument as the violin has connected us all. And I hope that whatever is served at your Thanksgiving table, it is accompanied by glorious music, which truly is the nourishment of our souls. November 21, 2018 at 11:02 PM · Diana, I'm so very glad you have found inspiration and good information here on Violinist.com, and also that you have written about your experiences, inspiring other people in return! I'm very thankful for all the readers, supporters and contributors to this site, and to all who encourage and inspire us in our art! During difficult and chaotic times, we can remember what the cellist Pablo Casals said, "Perhaps music will save the world." It certainly helps bring us together! 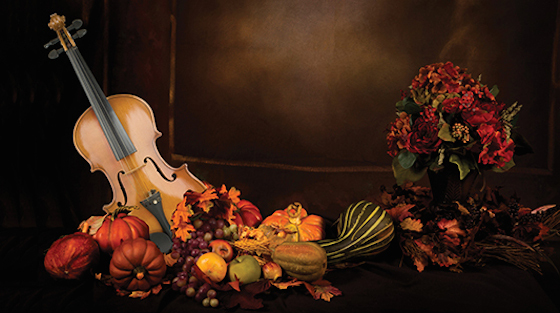 November 22, 2018 at 03:05 AM · Thanks very much to Diana and violinist.com for keeping music and the string music community at the top of our minds during this season of thanks giving. I can't imagine my life without the violin, and Diana and this forum continually remind me of why I was drawn to the instrument and its players in the first place! Thanks again to all. November 22, 2018 at 03:20 AM · I loved reading that, Diana. We have so many parallels and similar interests in our lives. I understand about reconnecting with a lost limb. One of the instruments I played in high school was the clarinet. During my college days I never touched it and my mother gave it away without asking. That limb has never been reconnected. Reading this has encouraged me to connect it one of these days. And yes, as you say we do have so much to give thanks for. I look forward to your contributions to v.com, love reading all the articles and thank you for them. They are exactly what I need and what helps to keep me going in a positive direction. At this time of giving thanks, above all let us thank music for uniting all of us across all borders and colors. November 22, 2018 at 04:11 AM · Thank you Diana, for this lovely tribute! I remember enjoying reading several of your blogs, as I am a trained scientist and now science teacher and we have some similar interests. And we share a love of chamber music! I especially relate to your point about its spanning decades and bringing people of different ages together. I am in one group where the other members are all retirees. I am the youngest member of that group by ~20 years. And I am in another group with millennials where I am the oldest member and only a little younger than some of their parents! November 22, 2018 at 01:21 PM · Diana, I appreciate your ability to sum up my own gratitude for this forum. While this has been a year of turmoil and tragedy, with abuse among colleagues and teachers brought to light, you share your joyful musical experiences. Every writer you mentioned reminds me to never forget how much music enriches my own life. I look forward to your next blog. November 22, 2018 at 02:13 PM · I attended a symposium with Allen Ginsburg and three or four of his old Beatnik buddies. One of them said, “Life can be simple if we want it to be so. It all boils down to this - create art and take care of the children.” I agree. Once we push all the nonsense aside, and clear the clouds, that’s pretty much it. Thank you for your gracious words. Diana, Karen, Laurie, and everyone -I hope you and your families have a great Thanksgiving. November 22, 2018 at 03:01 PM · Thank you, Diana. You expressed beautifully what many of us think including me. November 22, 2018 at 04:12 PM · Laurie: Thanks again for everything, and I love the Casals quote! To 207: Let's never imagine our lives without the violin! Thanks for your lovely comment. Joe: As always, your comment is beautiful and thought-provoking. Thanks for taking the time to respond (and I'll help you find that clarinet)! Karen: I am so appreciative of your wonderful note. As for the alto clef, perhaps you'll inspire me! Michael: "Create art and take care of the children." It's my new mantra. Thank you! November 22, 2018 at 04:27 PM · We love our brethren in the viola section, no joke! And cello and bass and gosh even the winds, brass, percussion...heck throw in the conductor! Feeling grateful for everyone today! November 22, 2018 at 04:34 PM · Thanks for sharing this. It has inspired this musician to get back to piano practice that I had set aside for far too long as I dealt with health issues. Practice time this evening! Happy Thanksgiving to all my friends! November 22, 2018 at 04:59 PM · It's refreshing to hear someone talk about the good things in life. Thank you, Diana. November 22, 2018 at 05:37 PM · To 150: What a beautiful and heartfelt comment! Thank you! To 92: You are most welcome! I'm so glad you liked the post! November 23, 2018 at 03:38 AM · To 108: Enjoy your practice session this evening and thank you for the kind comment! To 115: You are most welcome! To 57: That was a beautiful comment and I will keep the Bernstein quote always in mind. Wonderful! November 26, 2018 at 12:59 AM · I believe that the universal appeal of music is its ability to transcend the mundane, to elevate our spirits, or to deepen our sadness. New dimensions are added to every thing that we do and see when accompanied by music. I am grateful that music has been such a force in my life. I can't imagine a life without it. November 26, 2018 at 03:46 PM · I'm delighted music was part of your Thanksgiving celebration, Christina! Thanks for the kind words! To 22: Beautifully written! Thank you for sharing!